Government continues efforts to build peaceful cooperative ties with Pakistan as envisaged under the Simla Agreement and Lahore Declaration, while taking all necessary steps to protect the sovereignty and territorial integrity of the nation and the safety and security of our citizens. Government has been repeatedly conveying to Pakistan that it must abide by its commitment not to allow its territory or territories under its control to be used against India, and to respect the sanctity of the International Boundary and Line of Control. A list of meetings held between India and Pakistan in the last three years is enclosed at Annexure. 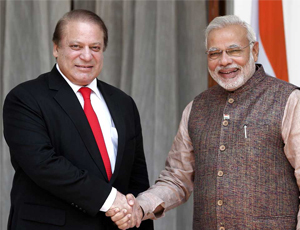 The details of interactions between India and Pakistan in the last three years are given below. Led a delegation of Indian businessmen to a trade fair in Lahore; held trade talks with Pakistan's Minister of Commerce. Hon'ble Speaker held discussions with her counterpart Ms. Fehmida Mirza & met Farooq Naek, Chairman of Pakistan's Senate. She called on then PM Gilani. This Information was given by the Minister of state in the Ministry of External Affairs Gen. (Retd.) Dr. V. K. Singh in Lok Sabha today. The Minister of State in the Ministry of External affairs Gen. (Dr.) V. K. Singh (Retd.) provided this information in reply to question in Lok Sabha today The names and contact details of all officers in our Missions and Posts abroad are available on the websites of our Missions. These websites also provide an emergency contact number in respect of each Mission/Post, through which they can be contacted in the event of any emergency faced by an Indian citizen abroad. These numbers are also available on the website of the Ministry of External Affairs (A copy of the list downloaded from the website is enclosed). Most of our Missions also maintain duty rosters according to which a staff member is deployed for emergency duty on weekends or on closed holidays. Any grievance or complaint brought to the attention of the Ministry through social media is duly attended to. However, there is no data available regarding such instances of complaints and redressal. In pursuance of “good governance” initiatives, the Ministry of External Affairs has launched an online Consular Grievances Monitoring System, named MADAD, on 21st February 2015, to extend a helping hand to Indians abroad requiring consular assistance. The Ministry of External Affairs (MEA) and the Ministry of Overseas Indian Affairs (MOIA) work together to address complaints received through MADAD. All our Missions and Posts abroad and the MEA’s Branch Secretariats in Chennai, Guwahati, Hyderabad and Kolkata, have been linked to this portal for consular grievance tracking and follow-up. The MADAD online portal represents a qualitative improvement over existing procedures for handling of consular grievances, through online forwarding, filing, tracking and escalation until their eventual resolution. It allows direct registration of the grievances by the members of the public and effective tracking of the entire grievance handling process all the way until the redressal of the grievance. Bahrain, Bhutan, Bolivia, British Virgin Islands, Cambodia, Cape Verde, Comoros, Cook Islands, Cote d'Ivoire, Djibouti, Dominica, Ecuador, El Salvador, Ethiopia, Fiji, Gabon, Georgia, Grenada, Guinea-Bissau, Guyana, Haiti, Hong Kong, Indonesia, Jamaica, Jordan, Kenya, Laos, Macau, Madagascar, Malaysia (visa on arrival under certain condition), Maldives, Mauritania, Mauritius, Micronesia, Moldova, Montserrat, Myanmar, Nepal, Niue, Palau, Reunion Island, Rwanda, Saint Kitts and Nevis, Saint Lucia, Saint Vincent and the Grenadines, Samoa, Sao Tome and Principe, Senegal, Seychelles, Somalia, Sri Lanka (Electronic Travel Authorization), Tanzania, Thailand, Timor-Leste, Togo, Trinidad and Tobago, Tuvalu, Uganda, Vanuatu, Zambia and Zimbabwe. The Government of India has already implemented the Tourist Visa on Arrival – Electronic Travel Authorisation (TvoA-ETA) since 27.11.2014. The scheme has been renamed as Electronic Tourist Visa (e-TV) and the Government of India has already extended the e-TV facility to 74 countries in the first two phases of its implementation. This Information was given by the Minister of state in the Ministry of External Affairs Gen. (Retd.) Dr. V. K. Singh in Lok Sabha today. The State-wise breakup of Haj pilgrims who performed Haj during 2012, 2013, and 2014 through HCOI is enclosed in Annexure. No State-wise breakup of pilgrims undertaking Haj through PTOs is available. Ministry of External Affairs coordinates the Haj arrangements, in consultation with Haj Committee of India and Consulate General of India (CGI), Jeddah. Ministry of External Affairs also sends 546 deputationists every year (Coordinators, Assistant Haj Officers, Haj Assistants, Doctors & Para-medical staff) for rendering assistance to the Haj pilgrims. With the approval of Ministry of External Affairs, Consulate General of India, Jeddah arranges for temporary Tents in Mina, sets up Dispensaries, Branch Haj Offices, arranges ambulances and other local transport for the Haj pilgrims. Medicines and medical equipment are supplied by MEA to Consulate General of India, Jeddah to meet the medical requirements of Haj pilgrims. During Haj-2014, medicines worth Rs. 2.60 crores were supplied. Similar arrangements for deputationists, logistics arrangements by CGI, Jeddah & supply of medicines are being made for Haj-2015. Ministry of Civil Aviation supervises the Air Charter operation during Haj period and deploys officials for support in Saudi Arabia to assist in embarkation and disembarkation of pilgrims. Ministry of Civil Aviation provides subsidy for air travel to pilgrims performing Haj through Haj Committee of India. The amount on air travel charged per pilgrim during Haj 2014 was Rs. 35,000/- whereas the actual air fare ranges from Rs. 63,750 to Rs. 1,63,350 depending on the embarkation point in India. For Haj-2015, an amount of Rs. 42,000/- will be charged as airfare from each pilgrim performing Haj through HCOI. The Supreme Court has directed in 2012 that the subsidy on air travel should be phased out in ten years. The subsidy has been reduced from Rs.836.56 crores in 2012 to Rs. 680.03 crores in 2013. In 2014, it has further reduced to Rs. 533 crores. The Haj pilgrims pay for the expenses incurred on air passage, accommodation, local transport within Saudi Arabia and food in Madinah etc. For Haj-2015, Haj Committee will be charging Rs. 2,15,000 per pilgrim for those staying in Green Area and Rs.1,76,000 from those staying in Azizia Area of Makkah. Haj Committee of India meets the costs of the Haj pilgrimage through the payments made by the pilgrims. No external grant is provided by the Ministry of External Affairs to Haj Committee of India. There is also no separate Haj Yatra Fund. v. Haj Committee of India : 200 seats. The minister of state in the ministry of external affairs Gen. (Dr) V. K. Singh (retd) informed the members of Lok Sabha today in reply to a question that (i) It would be incorrect to say that a large number of applicants seeking passport services are unable to use online method as often server goes down and the process of giving information is complex. Effective technical infrastructure is in place to ensure that the Passport Seva system is available for access at all times from any location. The Passport Portal (www.passportindia.gov.in) is accessible to anyone, anywhere and anytime. With a view to address the challenge of digital divide, especially in the rural hinterland, the Ministry in association with CSC e-Governance Services India Ltd. (which is promoted by the Department of Electronics and IT), has facilitated online filing of passport applications, through the vast network of over one lakh Common Service Centres (CSCs) across rural hinterland. Under the Passport Seva Project, a robust information system has been created to offer a bouquet of online passport services. (ii) Comprehensive information relating to passport application procedure, requirement of supporting documents, applicable fees, location of Passport Offices, Passport Seva Kendras, police station jurisdiction is posted on the Portal to make it user-friendly. It is kept updated with Advisories/Notices and Press Releases relating to Passport services developments. Status of applications can be tracked through the Passport Portal. (iii) An e-mail based helpdesk facility and a 24x7 National Call Centre has been set up to provide requisite information to citizens. (iv) The Passport Seva system sends four free of cost SMS to applicants - (i) at the time of dispatch of passport, (ii) in ‘returned undelivered’ passport cases, (iii) rejection of request for counter delivery cases and (iv) clear Police Verification(PV) report in pre-PV PCC cases or review of PV and clearance by the PIA. In addition, a premium optional SMS Service, on nominal payment basis, has been made available to enable citizens to receive alerts and updates regarding detailed progress of their passport applications and pending actions. The service can be availed from any mobile phone. (v) mPassport Seva mobile app provides passport related information including PSK locator, applicable fees, mode of submission and tracking of passport application status on smart phones. (vi) For assistance, citizens can call toll-free helpline 1800-258-1800. (vii) The Passport system has interface with the police for verification of personal particulars of applicants and with India Post for tracking delivery of passports. I. Police Verification: Police Verification of applicants’ particulars plays an important role in timely dispatch of passports. The Ministry as well as the Passport Offices continue to engage closely with the Police Departments across States/Union Territories and with concerned Home Departments to reduce time taken in police verification. II. The Government has set up 77 PSKs across the country. The number of public dealing counters has been increased from the erstwhile 350 to 1610 in the new system and public dealing hours have gone up from 4 hours to 7 hours a day. III. Greater outreach: The Government is working on setting up 18 more PSKs in addition to the existing functional 77 PSKs across the country. Five of these additional have already been operationalised. IV. In order to speed up passport issuance, Walk-in facility has been allowed for certain categories of services/ citizens having Application Registration Number (ARN) to enable them to apply for Tatkaal services ; issue of Police Clearance Certificate (PCC) ; deletion of Emigration Check Required(ECR) status; inclusion of name of spouse in passport and new booklets where pages have been exhausted. Senior citizens (above 60 years); minors below 15 whose parents hold valid passports; differently-abled persons; central/state government servants and their spouse/dependent minor children, have also been permitted walk-in facility. V. With a view to meet heavy and seasonal demand for passport services, Passport Melas are organized on weekends from time to time by Passport Offices. VI. Passport Seva Camps: In order to provide closer and speedier passport services to people located far away from PSKs, Passport Seva Camps are being organized at various locations in the country. VII. Passport Adalats, on need basis, are also conducted by Passport Offices to redress passport service grievances by dealing with citizens directly. VIII. Simplification of procedure: A number of steps have been taken to simplify passport application submission procedure such as acceptance of (a) registered rent agreement as proof of address, (b) self-attested documents replacing the requirement of attestation by gazetted officers, (c) Photo passbooks issued by Scheduled private sector Indian banks and Regional Rural banks also as proof of address and identity. The Government has also liberalised the requirement of acceptance of Birth Certificate of abandoned/orphaned children besides the requirement of NOC by Govt. officials for passport applications. The online system and establishment of PSKs have facilitated better accountability, transparency and streamlining of passport service delivery. This has also helped in issuing error-free and more secure passports. The time taken in issuing passports has decreased since the introduction of online application system and opening of PSKs. During the period January–June, 2015, 90% passports were issued within 14 days (excluding the time taken for verification) compared to 59% during January-June, 2014. (iii) one working day in case of Tatkaal passports subject to production of requisite documents. Under the Passport Seva Project (PSP), the Government has put in place a strengthened Grievance Redressal system whereby a National Call Centre with a toll free number (1800-258-1800), operating in 17 languages and on 24X7 basis, has been set up to cater to dissemination of information and handling of grievances. Also an e-mail based help desk has been set up which can be accessed by citizens through the www.passportindia.gov.in portal. There is a Public Grievance Redressal Cell (PGRC) established in the CPV Division of the Ministry under the supervision of the Joint Secretary (Passport Seva Project) & Chief Passport Officer. The Cell deals with grievances received through telephone, e-mail and post, as also references from various Government Offices such as President’s Secretariat, Prime Minister’s Office, Cabinet Secretariat, Central Vigilance Commission and Parliament Secretariat. All the Passport Offices handle public grievances through the Centralised Public Grievance Redress and Monitoring System (CPGRAMS) website of the Government. Information and Facilitation Counters, Public Grievance Cell and Help Desks have been set up in Passport Offices to assist applicants and to attend to grievances/complaints expeditiously. The complaint/suggestion boxes are also installed at Passport Offices and Passport Seva Kendras. Passport Adalats, on need basis, are also conducted by Passport Offices to redress passport service grievances by dealing with citizens directly. To understand the citizen sentiments and to receive the feedback emanating from social media, especially generation-Y, Passport Seva program has a provision to capture inputs from Twitter, Facebook, Flickr and Youtube. Every Passport Office and the HQs of the Ministry (CPV Division) has Twitter/Facebook handler’s account and grievances are attended to regularly through these means as well. Provision of modern features such as: (a) Increased network and capacity (b) anywhere, anytime access by anyone (c) state-of-the-art infrastructure (d) a 24 x 7 National Call Centre and e-mail based helpdesk (e) integration of PSP network with Police and India Post and (f) a toll-free helpline 1800-258-1800. An SMS message is sent to the citizen as soon as the passport is dispatched. The online appointment system has been introduced to minimize waiting time for applicants. Appointments are allotted according to handling capacity of PSKs and are based on electronic queue management system. The number of public dealing counters has been increased from the erstwhile 350 to 1610 in the new system and public dealing hours have gone up from 4 hours to 7 hours a day. The Government has (a) introduced online payment of passport fees or optionally through SBI Challans at the time of filing the application; (b) upgraded Passport Portal to make it more user-friendly; (c) launched mPassport Seva app. A premium optional paid SMS service is also available. The facilities and amenities at the PSKs, include photocopying, food and beverage facilities, public phone booth, information kiosks, baby care room, newspapers and magazines and television. All the PSKs are air-conditioned. The Electronic Queue Management System ensures the ‘first-in-first-out’ principle in application processing. In order to speed up passport issuance, Walk-in facility has been allowed for certain categories of services/ citizens having Application Registration Number (ARN) to enable them to apply for Tatkaal services; issue of Police Clearance Certificate (PCC); deletion of Emigration Check Required(ECR) status; inclusion of name of spouse in passport and new booklets where pages have been exhausted. Senior citizens (above 60 years); minors below 15 whose parents hold valid passports; differently-abled persons; central/state government servants and their spouse/dependent minor children, have also been permitted walk-in facility. With a view to address the challenge of digital divide, especially in the rural hinterland, the Ministry in association with CSC e-Governance Services India Ltd. (which is promoted by the Department of Electronics and IT), has facilitated online filing of passport applications, through the vast network of over one lakh Common Service Centres (CSCs) across rural hinterland. Effective technical infrastructure is in place to ensure that the Passport Seva system is available for access at all times from any location. (iv) Shortage of manpower in the Central Passport Organization, to deal with the increasing demand for services for meeting the 'desired service levels'. II. As regards delay in passport issuance, the Government has taken several corrective steps. As police verification of personal particulars and antecedents of applicants is critical to Passport issuance, Passport Offices keep in touch with Police to expedite Police Verification reports (PVRs). The efforts have shown results as PVRs in Andhra Pradesh, Chandigarh, Delhi, Goa, Haryana and Telangana are now being received within 3 weeks. As on 1st July, 2015, out of 728 total police districts in the country, 654 districts have moved to the preferred DPHQ model. III. Passport Offices conduct Passport Melas at PSKs on weekends from time to time for meeting high demand of passports. IV. In order to provide closer and speedier passport services to people located far away from PSKs, Passport Seva Camps are being organized at various locations in the country. V. The Ministry has circulated a detailed compilation of instructions for the guidance of Central Passport Organisation (CPO) officials as well as the staff of the Service Provider to speed up acceptance of documents and processing of passport applications, to avoid irregularities in issuance of passports. VI. Inspections of PSKs and Passport Offices are conducted from time to time to improve service delivery. VII. Steps have also been taken to fill up the existing vacancies by recruitment through the Staff Selection Commission (SSC), fast-track promotion and deputation, wherever applicable. Pending filling up of vacancies on regular basis, the Ministry has engaged about 450 Data Entry Operators in the Passport Offices against vacant non-gazetted posts. About 10 retired CPO officials have also been engaged in various Passport Offices as Consultants on contractual basis to mitigate shortage of staff. VIII. In order to enhance the output and speed up passport issuance, the Government has implemented Productivity Linked Incentive Scheme (PLIS) to incentivise better performers. The Government has also instituted a system of awards to outstanding employees to recognise their efforts and contribution to good service delivery. The minister of external affairs Shrimati Sushma Swaraj in a Lok Sabha statement laid on the table of the House, on passport melas informed the house that the Government is aware of the difficulties faced by applicants at a few locations for not getting appointments promptly due to heavy demand for passport services which have increased by 30% in the last 2 years. It had also been observed that many of the applicants were not turning up at the Passport Seva Kendras (PSKs) despite scheduling valid appointments. This was not only resulting in lesser utilization of processing capacity of the PSKs, but was also causing denial of appointments to other genuine applicants. To meet heavy demand for passport services, the Government has been organizing Passport Melas at weekends at PSKs as per need. ‘Walk-in’ facility has also been allowed for certain categories of services and citizens such as Tatkaal passports, Police Clearance Certificates and issue of new booklets where pages have been exhausted, Senior citizens (above 60 years) and differently-abled persons. In order to provide closer and speedier passport services to people located far away from PSKs, Passport Seva Camps are also being organized at various locations in the country. To minimise ‘no-shows’, the Government has introduced online advance payment of passport fees since 5th July, 2013. These measures have resulted in substantial improvement in availability of appointments. As on 15th July, 2015, out of 82 PSKs, appointments were available in 59 PSKs within 7 calendar days, in 11 PSKs within 8 to 14 days, in 5 PSKs within 15 to 21 days and in 7 PSKs from 22 to 30 days. Comparatively, as on 1st September, 2014, out of 77 PSKs operational at that time, appointments were available in 29 PSKs within 7 days, in 11 PSKs within 8 to 14 days, in 11 PSKs within 15 to 21 days, in 10 PSKs between 22 to 30 days and in 16 PSKs beyond 30 days.